Emory Eye Center has offered cutting-edge LASIK procedures through Emory Vision for more than ten years. As an Emory Eye Center patient, you expect to be treated by the very best vision care specialists in Atlanta using the most advanced diagnostic and surgical techniques. What you might not expect is the personalized, concierge-type service you receive during each appointment. Our highly-experienced staff provides every patient with individual attention and works closely with Emory Vision’s physicians and surgeons to create the best possible diagnosis and treatment plans for your eyesight. Their goal is to help you make the most educated decisions about your care by answering any questions you might have and supporting you through every step of surgery and beyond. Laser in Situ Keratomileusis (“LASIK”) is a safe and effective laser procedure that can correct nearsightedness, farsightedness, and astigmatism. LASIK involves creating a protective flap from the outside layer of the cornea and sculpting the middle layer to correct refractive error and improve vision. The outside flap is then repositioned over the sculpted area, much like a Band-Aid. LASIK is a quick, usually painless, procedure. It is performed on a delicate part of the eye, and therefore an individual undergoing the procedure should understand the risks and the benefits, the importance of an initial screening exam by a physician, and have realistic expectations about the procedure’s outcome. Selecting the right surgeon – one who has the most knowledge about custom vision surgery and uses the most advanced technology – is a very important decision. It is critical that you find the center that has the physician with the surgical experience that will result in the finest vision for you. Emory provides the detailed, personalized information you will need to decide whether vision correction surgery is right for you. Your visit to Emory will provide an opportunity for you to meet us and learn more about how we can develop a customized vision correction surgery for you. You will find that the members of our team have many years of experience working in the field of vision correction, and they understand you will have many questions that need answering. The first step toward learning whether LASIK might be a good option is to schedule a free consultation with one of our cornea surgeons. In order to ensure the safety and effectiveness of every procedure, we conduct a thorough custom evaluation that includes two different Wavefront systems for mapping your cornea. We then confirm the results to provide a complete assessment of the best options for each individual’s vision improvement. Your personal vision profile will detail the shape of your eyes, how they respond in various lighting situations, how well they work together, and whether there are any factors that could negatively affect your surgical outcome. By creating this profile, the team makes sure that you are a good candidate for LASIK eye surgery. When you leave your consultation you’ll have all the information you need to make the best decision for yourself. For more than twenty years, Emory cornea specialists have earned worldwide recognition for their expertise in general refractive surgical techniques that improve vision and reduce or eliminate the need for glasses or contacts. Our specialists have contributed research toward every advance in refractive surgery techniques, including refractive keratotomy (RK), photo refractive keratotomy (PRK), LASIK, LASEK (laser epithelial keratomileusis) and phakic intraocular lenses (IOLs). Emory Eye Center has delivered excellent LASIK eye surgery care to thousands of patients. Our team listens to you and aims to deliver the best treatments and outcomes possible. The staff at Emory is frequently asked questions about LASIK eye surgery. You can find a list of common questions with answers below regarding the LASIK procedure. What can I expect from LASIK? The combination of customized vision assessment and correction, state-of-the-art technologies and the renowned expertise provided by Emory Vision, can lead to dramatically improved vision after LASIK. According to the Eye Surgery Education Council Medical Advisory Board, many millions of LASIK procedures have been conducted, and less than 1 percent of patients have experienced serious vision problems. Complications are rare but usually resolve within a few months of surgery. Some LASIK patients may require an enhancement (re-treatment) after their initial surgery to achieve the optimal outcome. This may be done about three months after the original procedure. Who is the “ideal candidate” for LASIK? is thoroughly informed about the benefits and risks of the procedure by thoroughly discussing the procedure with their physicians and understanding that foremost people, the goal of refractive surgery should be the reduction of dependency on glasses and contact lenses, not their complete elimination. Who is the “less than ideal” candidate for LASIK? Many factors exist that preclude a candidate from being ideal for LASIK surgery. In many of these cases, a surgeon may still be able to perform LASIK, or, at Emory Vision, we may suggest one of several other refractive surgery options that can safely reduce your dependence on glasses or contact lenses. The key is to work with a physician who is motivated solely by the goal to provide the highest quality vision and long-term satisfaction for you. Who is the “non-LASIK” candidate? do not give informed consent. What are myopia, hyperopia, and astigmatism? People with myopia (nearsightedness) have more difficulty seeing distant objects as clearly as near objects. People with hyperopia (farsightedness) have more difficulty seeing near objects as clearly as distant objects. Astigmatism is a distortion of the image on the retina caused by irregularities in the cornea or lens of the eye. Combinations of myopia and astigmatism or hyperopia and astigmatism are common. 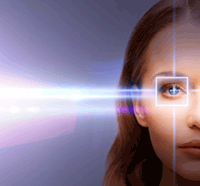 Today’s LASIK technology allows surgeons to treat patients with any of these conditions. Is LASIK right for everyone? Take medications with ocular side effects (such as Accutane® or Cordarone®). The exam completed during Emory’s free consultation will help the physician determine whether LASIK will be successful on patients with these conditions. The FDA recognizes LASIK as proven, safe, and effective. According to guidelines released by the Eye Surgery Education Council (ESEC), fewer than 1% of patients who have received LASIK to date have experienced serious, vision-threatening problems. Most LASIK complications can be treated and usually resolve within several months of surgery. There are no known cases of blindness resulting from LASIK. What are the risks associated with LASIK? Halos - Some patients will notice glare, halos or starburst around objects in low-light conditions. For the vast majority, these symptoms are temporary. However, others will continue to experience them for several months or longer. During pre-operative evaluation, the refractive surgeon can determine whether or not a person is at high risk for seeing long-term halos. Dry eyes - There is increased dryness of the eyes typically for several months following LASIK, though some patients may experience dryness for a longer period of time. It is important to use lubricating drops frequently. If the eyes remain dry for prolonged period, there are other drops or techniques that can help. Pre-operative evaluation will help determine whether or not a person is a likely candidate for experiencing dry eyes. Infection - This is an extremely rare occurrence, with a 1 in 2000-3000 chance (similar to any eye surgery). Fortunately, firmly established protocols exist which minimize the risk of infection. What happens before LASIK surgery? Before a surgeon will perform LASIK, preoperative tests are performed to screen for glaucoma, cataracts, and other disqualifying conditions. At Emory Eye Center, we also take corneal photographs and complete several electronic maps of the eye to gather more information about the individual’s eyes prior to treatment. Because contact lenses change the shape of the cornea, LASIK candidates are required to switch to eyeglasses before their consultation and baseline evaluation, and continue wearing only eyeglasses for 2 to 4 weeks before LASIK surgery. Not leaving contact lenses out long enough for the cornea to assume its natural shape before surgery can cause inaccurate measurements and poor vision after surgery. Once the surgeon has conducted all pre-operative examinations, the eye is anesthetized with numbing eye drops, the area around the eye is cleaned, and an instrument called a lid speculum is used to hold the eyelids open. The surgeon then uses a specialized instrument, called a microkeratome, to cut a thin, circular flap - the outermost 20 percent of the thickness of the cornea - to expose the portion beneath. This part of the procedure is called keratectomy. While the inner cornea (the stroma) is exposed, the surgeon will ask the patient to fixate on a specific light source above the patient. This is to ensure that the laser beam is aligned precisely with the center of the patient’s eye. Once the eye is in the correct position, the laser treatment is performed. The computer-controlled excimer laser removes the tissue under the flap and reshapes the cornea of the eye. In less than 60 seconds, ultraviolet light and high-energy pulses from the excimer laser reshape the internal cornea with accuracy up to 0.25 microns, or 1/4000 of a millimeter. After the pulses of laser energy vaporize the corneal tissue, the flap is put back into its original position. The surgeon will observe the eye for three to five minutes to ensure bonding. Because the cornea bonds quickly, healing is rapid, and the eye does not require stitches. LASIK is painless, although many people experience several hours of mild irritation after their LASIK procedure. The laser treatment itself usually takes less than a minute, while the entire procedure takes around 15 minutes per eye. How long must people wait to resume normal activities after LASIK treatment? In most cases, people can return to work within 1 to 3 days following LASIK surgery. People cannot drive until after the 24-hour post-op visit or until a doctor says it is safe to drive. Women can start wearing makeup within two to three days of treatment; however, they are advised to wear only new cosmetics in order to decrease risk of infection. Will a person’s vision remain stable long after the procedure? The vision correction is permanent. However, a person’s vision may change naturally with time and LASIK does not affect visual conditions that may develop with age (such as cataract). Having LASIK also does not prevent presbyopia and the eventual need for reading glasses. Depending on the cause, retreatment may be a viable solution to later vision changes, and other treatment options also exist. If you continue your annual eye exams with an Emory Eye Center doctor after surgery, your LASIK result will be guaranteed for five years. Terms and conditions do apply. For example, you must complete your post-surgery appointments and have your annual eye exams with an Emory Eye Center doctor for five years following LASIK. For the 12 months following refractive surgery, patients receive high quality care focused on the patient’s optimal visual outcome. Post-operative visits related to the refractive surgery at no charge. Typically, these appointments are held one day, one month, and one year following surgery. The post-operative period does not include care for other medical conditions that may require examination and treatment during this period. For patients scheduling an initial exam, here are some of the forms that you will need to complete. For your convenience, you can print them out and complete them prior to your arrival. being gentle to the patient.